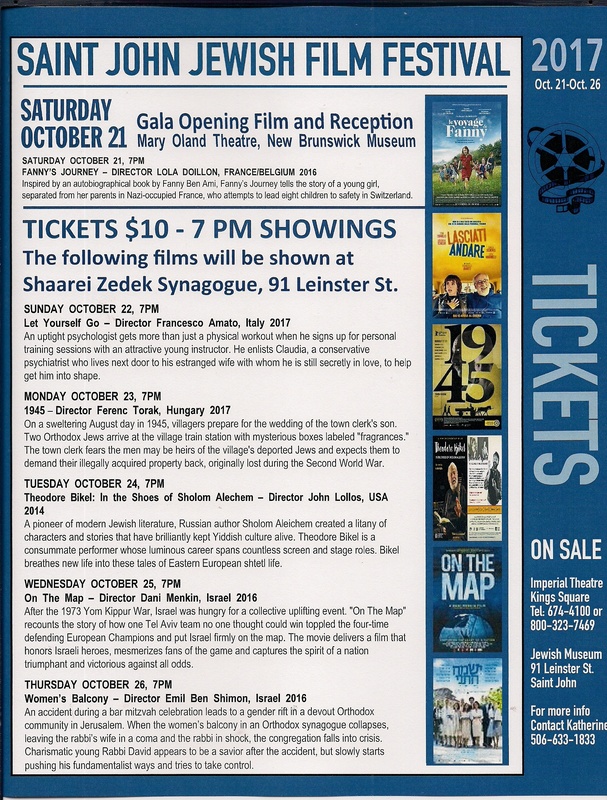 The Saint John Jewish Historical Museum is pleased to announce that it will be holding the Fourth Annual Saint John Jewish Film Festival from October 21 to October 26, 2017. The films to be shown will be primarily prize winning films that have been featured in prestigious film festivals around the world. 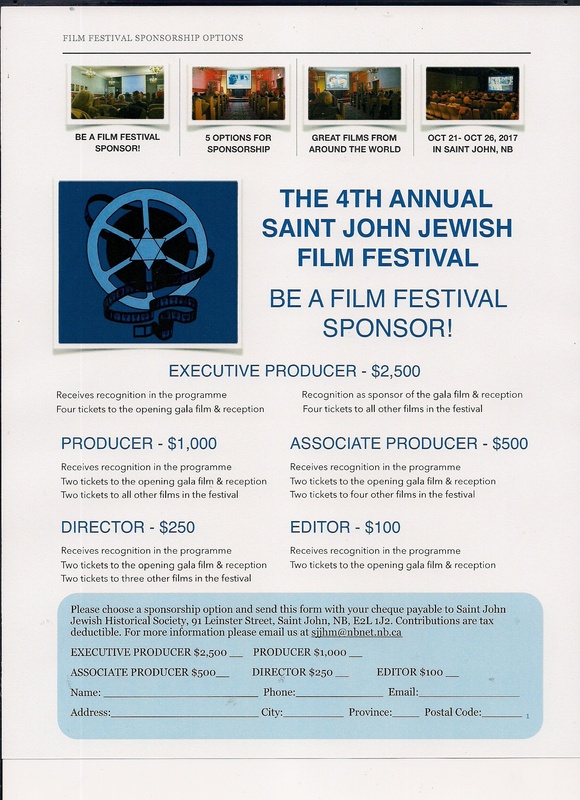 The proceeds from the film festival will support the work of the Saint John Jewish Historical Museum to preserve the Jewish history of Saint John. These films will include every genre including comedy, tragedy, documentary, biographical and historical. They will have a broad appeal and be entertaining while drawing on the Jewish experience. The Gala Opening Film and Reception (for event sponsors only) will be screened at the Mary Oland Theatre, New Brunswick Museum on Saturday, October 21 at 7:00 p.m. The film will be Fanny’s Journey directed by Lola Doillon (France/Belgium 2016) - Inspired by an autobiographical book by Fanny Ben Ami, Fanny’s Journey tells the story of a young girl, separated from her parents in Nazi-occupied France, who attempts to lead eight children to safety in Switzerland. 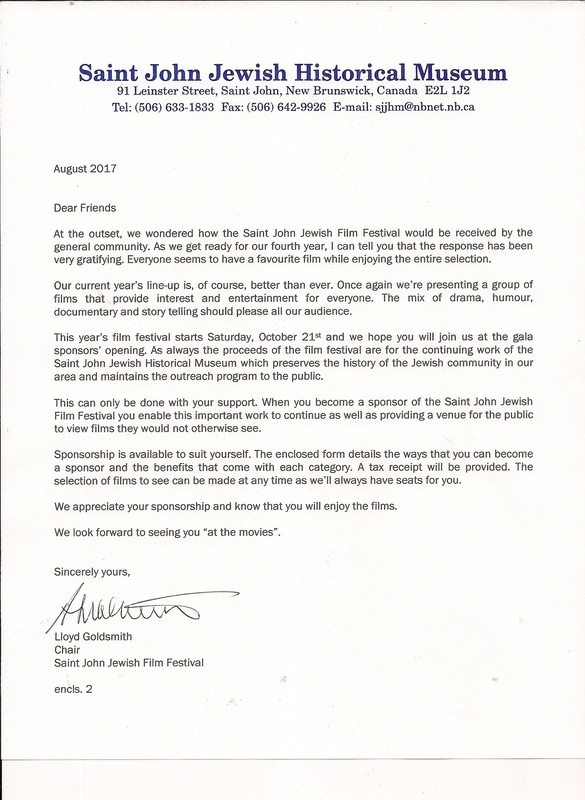 The remaining films will be screened at the Saint John Jewish Historical Museum, 91 Leinster Street. Tickets for the 7:00 p.m. showings can be purchased for $10 / film at the Saint John Jewish Historical Museum and the Imperial Theatre box office. An uptight psychologist gets more than just a physical workout when he signs up for personal training sessions with an attractive young instructor. He enlists Claudia, a conservative psychiatrist who lives next door to his estranged wife with whom he is still secretly in love, to help get him into shape. On a sweltering August day in 1945, villagers prepare for the wedding of the town clerk's son. Two Orthodox Jews arrive at the village train station with mysterious boxes labeled "fragrances." The town clerk fears the men may be heirs of the village's deported Jews and expects them to demand their illegally acquired property back, originally lost during the second World War. A pioneer of modern Jewish literature, Russian author Sholom Aleichem created a litany of characters and stories that have brilliantly kept Yiddish culture alive. Theodore Bikel is a consummate performer whose luminous career spans countless screen and stage roles. Bikel breathes new life into these tales of Eastern European shtetl life. After the 1973 Yom Kippur War, Israel was hungry for a collective uplifting event. "On The Map" recounts the story of how one Tel Aviv team no one thought could win toppled the four-time defending European Champions and put Israel firmly on the map. The movie delivers a film that honors Israeli heroes, mesmerizes fans of the game and captures the spirit of a nation triumphant and victorious against all odds. An accident during a bar mitzvah celebration leads to a gender rift in a devout Orthodox community in Jerusalem. When the women’s balcony in an Orthodox synagogue collapses, leaving the rabbi’s wife in a coma and the rabbi in shock, the congregation falls into crisis. Charismatic young Rabbi David appears to be a savior after the accident, but slowly starts pushing his fundamentalist ways and tries to take control.